As Mercury enters Sagittarius today you may feel a sense of freedom with your thoughts and words. Sometimes this is good and other times it is a bit risky… especially if you don’t think before you speak. From the image on this card you can see that there is the distinct risk that you may say something without curtailing the way it comes out of your mouth. Even though the bird’s beak is closed the flames that lick around the feathers show there is energy that is trapped within… and energy has to go somewhere unless you are very good at dissipating it. The tree stump suggests that the issue you are wishing to speak on has no end in sight or that the matter is a closed as far as others are concerned. Nevertheless, it seems you are keeping an eye on when you can bring it up again. Just as the sun rises this matter has not been put to rest in your mind or thoughts. If you are expecting news today may be the day you receive it. It is a great day to pick up your thoughts and start to feed some positivity in your life. Learning something new may take on a new meaning for you today and if you have any feelers to put out there on a course you are interested in then the rolling hills that you are surveying from high up will show you, if any, problems you may encounter. It doesn’t look as if you will though as you are sitting pretty high above the petty, mundane problems of everyday life today and are ready to launch yourself into something new and exciting. 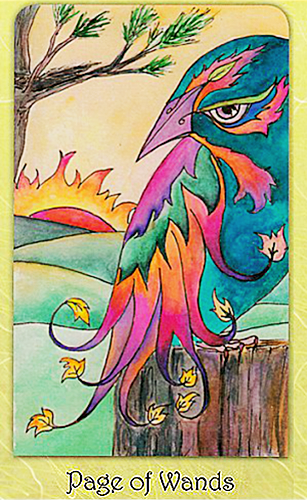 The card used for today’s tarotscope — Page of Wands — is part of the Dream Raven Tarot collection, designed and created by Beth Seilonen, published by Schiffer Publishing. Used by generous permission. These beautiful cards can also be found at her Etsy storefront. Please visit and “like” her Facebook Fan page!